The Incredible Exposition of Alan Wake, Ep 4 | SPACE-BIFF! A cardboard cutout of Alan Wake, gazing into your soul. 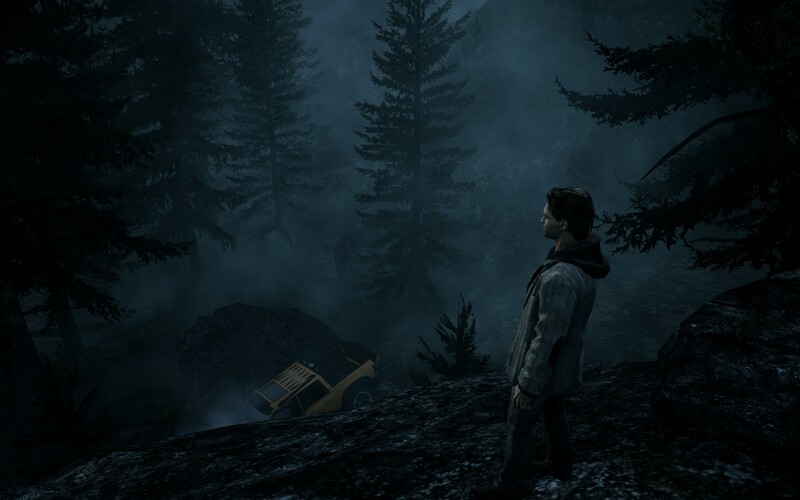 The last time I talked about Alan Wake, I mentioned a few of its more brilliant plot points from the first three episodes. Well, I’m still hooked, and I recently finished the game’s fourth episode. I must warn that there are spoilers to come, as episode 4 is entitled “The Truth,” and boy, what an apt name to call it by. So if you don’t mind this great game being spoiled, I’d like to talk about its gentle handling of exposition. 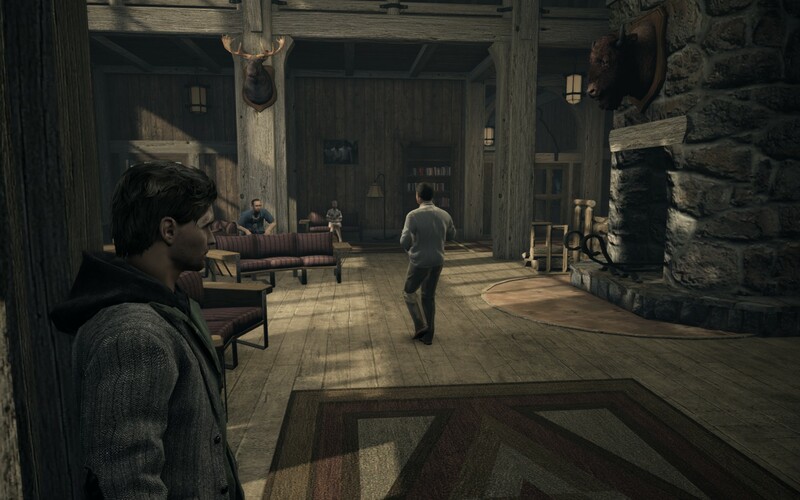 Alan Wake wakes up in the loony cabin. After spending a few too many cool summer evenings jogging through the woods and battling a couple hundred shadow-possessed rednecks, cops, loggers, and campers along the way, Alan accidentally slips off a mile-high ledge and falls dramatically (lit flare in hand) into the murky Cauldron Lake below. He then wakes up in a clinic for insane artists. Masterfully, rather than you playing the game, the game plays you for a bit, and you can’t be sure whether the darkness is real or if Alan is insane! This lasts for about eight minutes, and then the darkness attacks the clinic and transforms the patients and staff into monsters. With Alan’s sanity assured, he escapes with the help of his agent Barry. Alan, Cardboard Cutout Alan, and Barry talk about their hopes and dreams. Barry and Alan drive along the road, bickering about something. At this point, it’s easy to become a bit bored because Alan explains stuff we already know: Cauldron Lake is evil and makes the creative work of artists come true. Cauldron Lake doesn’t like being invoked like this, so it interrupts the scene by making Barry drive like an idiot and swerve off the road. Alan in the forest once more. Alan and Barry are separated by the crash, so Alan runs around for a while, this time being hunted by a fresh new enemy: possessed farmers. He’s undefended for a while, so he’s relieved to find the same model of flashlight and revolver that he was carrying before, which allows him to do righteous battle. Alan overlooks a small farming community. A few hours later, Alan and Barry meet up and put on a good old-fashioned music show, using the old stage that the farmers had used to rock out a couple decades ago. This attracts like a thousand possessed farmers, but Alan and Barry use the stage’s ancient lights to blast them. Then Barry waits around while Alan figures some stuff out, like how to use a longboat as a battering ram, and fights another demonic tractor. Cardboard Cutout Alan delivers a smackdown. Alan and Barry decide to crash in the main farmhouse, where they listen to music and get drunk, even though there are probably a bunch of possessed farmers still milling around. Alan decides to listen to some Poets of the Fall. Alan sneaks away as a Big Daddy ransacks the place. And that’s how Alan came to be saved by a Big Daddy, and was free to fight against the darkness. 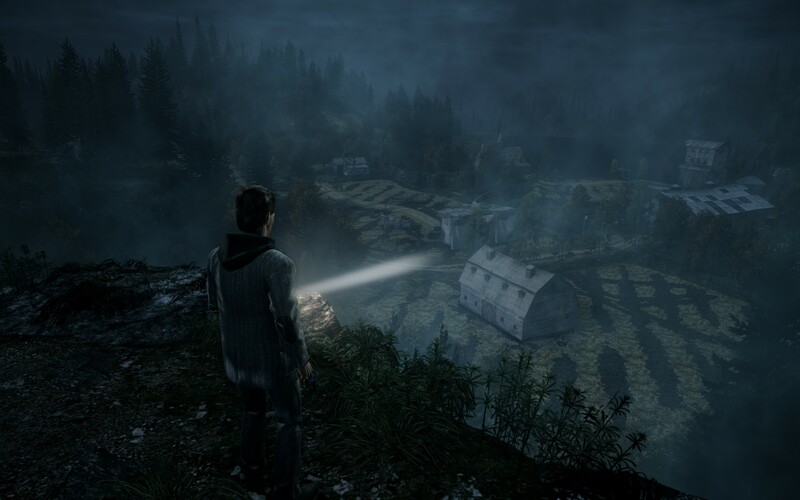 Posted on May 28, 2012, in How-to and tagged Alan Wake, Remedy. Bookmark the permalink. 8 Comments. But Dan, I’ve got a question. 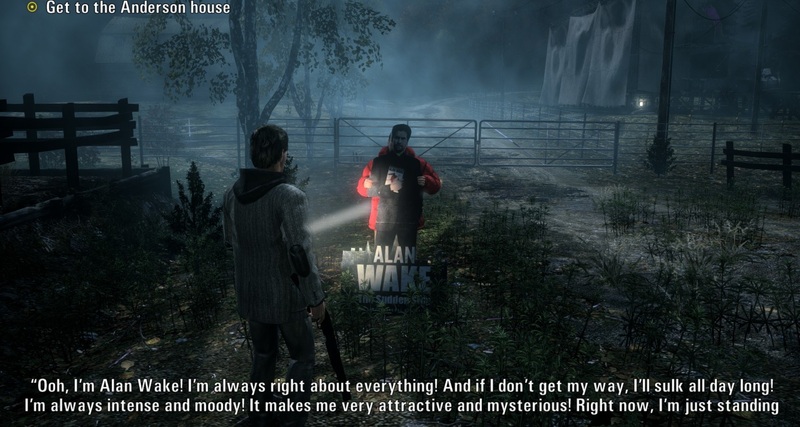 Do you HATE Alan Wake? Are we going to see an actual review? Would you recommend it? It sounds like you think the story is horrible, but it also sounds like you’re having the time of your life. 1. Forests, no matter how beautiful, become boring when overused. I mean, people get lost in real forests all the time, because in spite of their looks, some part of our brain loses the detail and makes them seem samey. 2. If something happens all the time, there’s no reason to be surprised when it does. Ergo: enemies stepping out behind Alan every thirty seconds stop being surprising halfway into minute two. 3. The combat isn’t that great. You’re basically just managing two types of ammo (flashlight & gun). I can’t think of any games that use “twist” combat well—I’m also thinking of Dead Space here, where the need to kill enemies with a special tactic gets pretty tedious when performing the same action a hundred times. 4. The story is alternately moan-inducing and hilarious. If the game had run with the campy side of things more, it would have been many times improved. There are also other things I’d bring up, but that would be my review in a nutshell. Of course, I haven’t even *finished* it yet. Episode 4 was much more interesting than the first three, so maybe eps 5 and 6 will blow me out of the water. Sounds good! I was thinking of a purchase during one of the many recent sales, but Ive got a big backlog to work through already. This is my favorite set of reviews ever. So instead of the Big Daddy being armed with a drillbit and a gun, he has tiny pincher hands? That’s so lamesauce that it makes me want the evil lake to win.